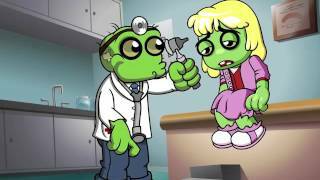 //Powerhouse Animation Studio created this trailer for the game Zombie Life, developed by our friends at The Playforge, who are also responsible for Tree World and Eat Eat Hooray--which you may recognize from our portfolio. Zombie Life is a mobile game that begins when you wake up as a zombie and and are forced to blend in with the normal living people. Don't let anybody know, though- people will run away screaming from you! Download it from the app store and see for yourself! Game trailers are like explainer videos for games. It is a way for a game studio to find its fan base before launch and help separate themselves from the many other games being launched at the same time. Powerhouse Animation has created many game trailers for companies like The Playforge. Let us know about your next game and we can create a way to excite folks about your impending launch while finding your fans through social media to inform them about your game and other titles later.